Trim the bases from the little gem lettuce then separate the leaves, wash and dry then put into a large bowl. Trim the stalks from the fennel, saving any feathery fronds. Cut in half then slice as finely as possible, alternatively chop into small pieces, add to the leaves. Halve and quarter the apples, discard the core and slice thinly, add to the salad. Whisk together all the ingredients for the dressing until smooth, then pour over the salad and toss together. Divide between four serving plates. Cut the Five Counties® cheese into slices, about 5mm / 1/4 inch thick, then cut lengthways into long strips about the same width. 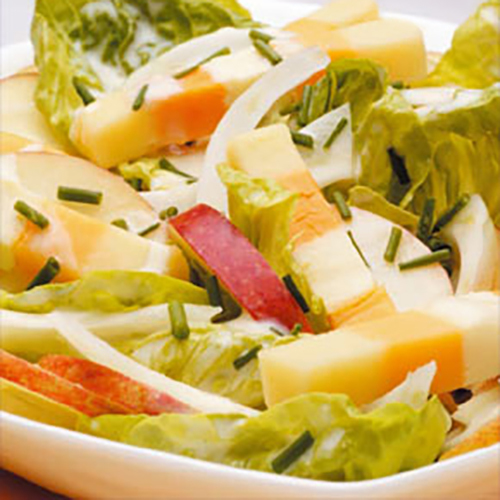 Lay the strips of cheese on the salad, some strips may fall apart. Snip the chives and chop any fennel fronds then scatter over the salad. Variations: try using pears or peaches instead of the apples. For a variation with the dressing, plain yogurt can be used instead of the mayonnaise.